Seller will give you a gift certificate in the amount of 3,6 RUB for a positive review of the product purchased. Solution of the C5 version of 99 Reshebnik on theoretical mechanics to Taskbook Targ SM 1982. Subject objectives C5 - balance of the body by the action of an arbitrary spatial system of forces. 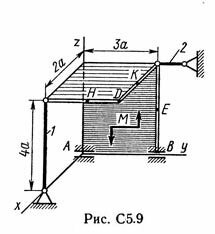 Two homogeneous thin rectangular plate fixedly connected (welded) at right angles to each other and fixed spherical joint (or glide) at point A, a cylindrical hinge (bearing) at point B and weightless rod 1 (Fig S5.0 -. S5.7 ) or two bearings at points a and B and two weightless rods 1 and 2 (Fig S5.8, S5.9). ; All rods are attached to the plates and to the fixed support hinges. Dimensions of plates shown in the figures; more weight plates P1 = 5 kN, the weight at the plate P2 = 3 kN. Each of the plates is parallel to one of the coordinate planes (xy plane - horizontal). On the plate a force couple acting moment M = 4 kN · m, which lies in the plane of one of the plates, and the two forces. The values ​​of these forces and their direction and point of application are listed in Table. C5; wherein forces F1 and F4 are in planes parallel to the xy plane, the force F2 - in a plane parallel to the xz, and force F3 - in a plane parallel to the yz. force application points (D, E, H, K) are in the corners or in the middle of the sides plates. Determine the constraint reactions at points A and B and the reaction rod (rods). 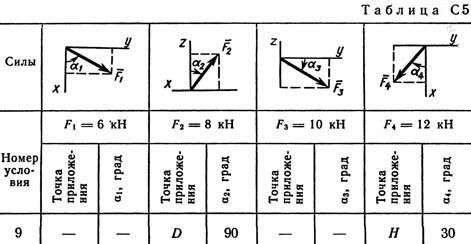 When calculating take a = 0.6 m.
After payment you will receive a link to the zip file with the decision of problems of statics 5 option 10 on the theoretical mechanics of Reshebnik Targ SM 1982 for part-time students. The decision is made by the methodical instructions and control tasks for part-time students of construction, transport, machine-building and instrument-making professions universities. The decision is decorated in word format with all necessary explanations .. Please leave the decision after receiving a positive response. And get vauchek discount on the next item. Seller will give you a gift certificate in the amount of 3,6 RUB for a positive review of the product purchased..